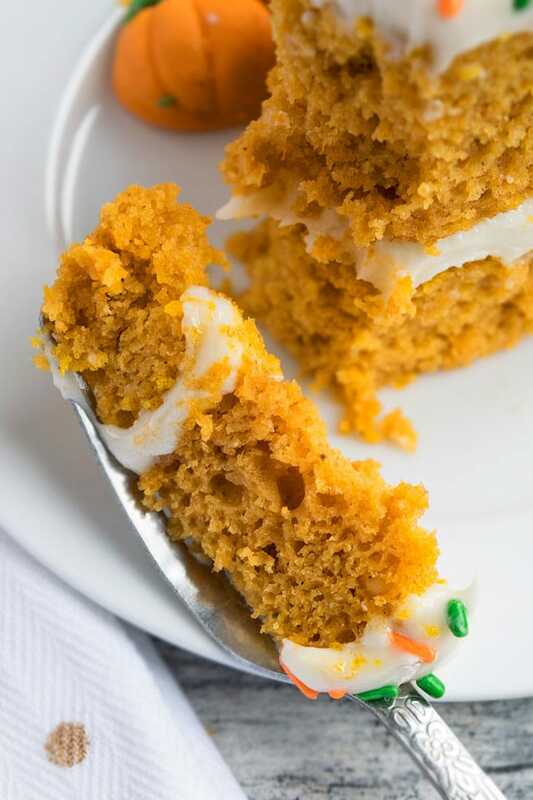 The best spiced, soft, moist, quick, easy pumpkin cake recipe with cream cheese frosting. This doctored yellow cake mix recipe is great for Thanksgiving. If you are looking for an easy pumpkin cake with cream cheese frosting, look no further because this doctored cake mix recipe is perfect! It’s soft and moist and has the perfect balance of spices (cinnamon, nutmeg and a little ginger) without becoming overwhelming. This is just as popular with my friends as this Easy Apple Cake Recipe with Cake Mix and my Pumpkin Cheesecake with Gingersnap Crust. 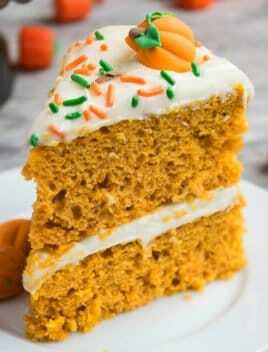 This is the best pumpkin cake ever! I have tried many pumpkin cakes from scratch and some are actually quite good but none of those recipes have yielded such an incredible moist cake. 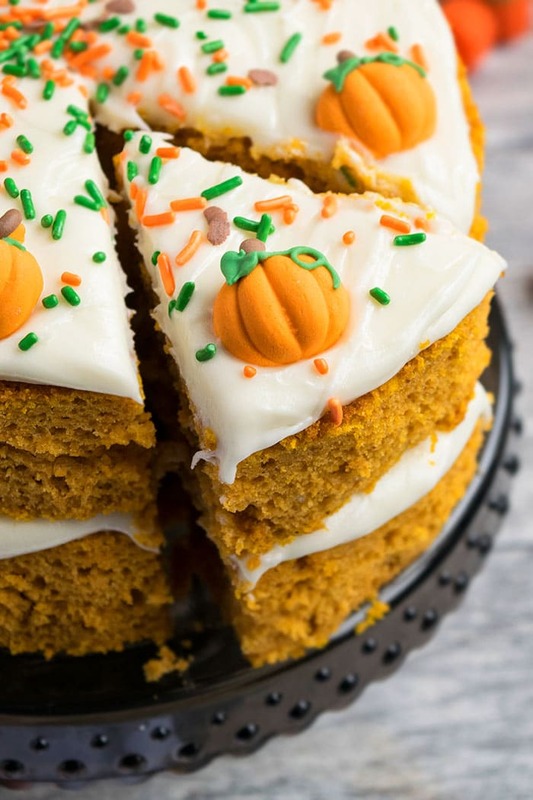 This is the ultimate moist pumpkin cake! The reason for that is the addition of 4 large eggs and pumpkin puree. Both ingredients add a lot of moisture. 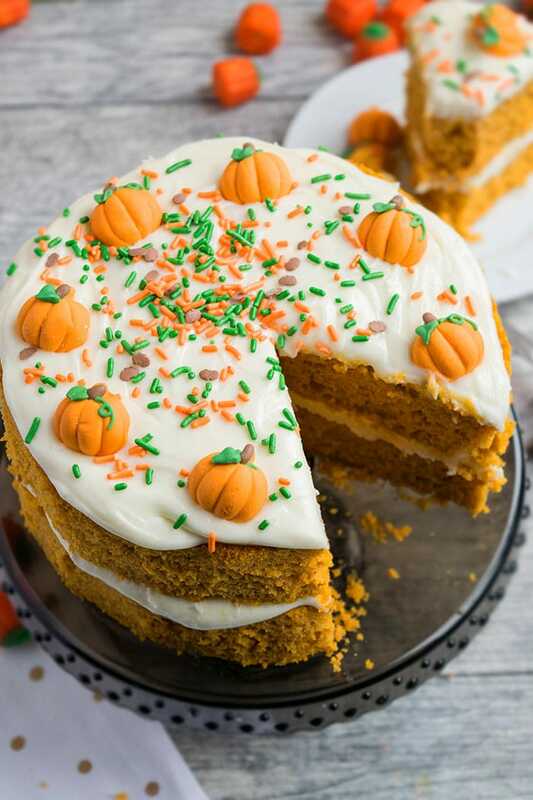 This easy pumpkin cake recipe requires simple ingredients! This is not a pumpkin dump cake nor is it a pumpkin pie cake! Both of those use a yellow cake mix but the process and the other ingredients are entirely different. It’s dense and has a texture that’s similar to a cobbler/ pie. Also, everything is typically dumped in a baking pan and baked. 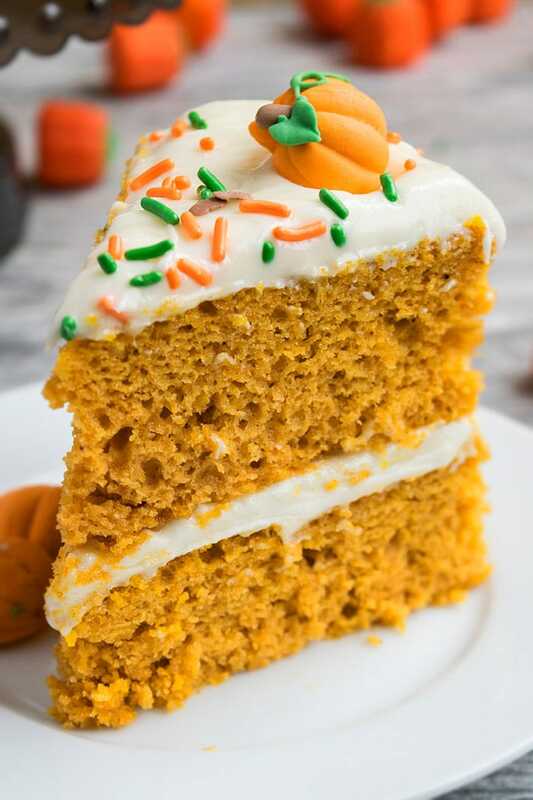 How do you make a pumpkin cake from cake mix/ yellow cake mix? Beat the eggs with oil and water until fluffy. Mix in the pumpkin puree until smooth. Add cake mix, spices and mix until combined. Bake and allow the cakes to cool down. Ice the cake in cream cheese frosting. Decorate with sprinkles and pumpkin candies and you are done. I use canned pumpkin puree because it’s easier and readily available at grocery stores but you can use homemade fresh pumpkin puree too. Just make sure it’s not too thin. You can easily pour this batter in a 10 inch rectangle cake pan and make a sheet cake. Instead of cream cheese frosting, ice this cake with chocolate buttercream frosting or even chocolate ganache. Prepare a classic crumble topping and sprinkle it on top of the cake, prior to baking. Don’t throw away cake scraps. Use those make cake pops. I have a tutorial here for how to make cake pops and cake balls. Add layer of chopped roasted nuts on top of the frosting between each layer as well as the top to give each bite a crunch. You can’t use this recipe to make a bundt cake because bundt cakes typically have a firmer texture and a fairly thick batter, which makes it easier to remove it from the bundt pan without any breaking. Since this is a melt in your mouth soft cake, it won’t be suitable for bundt cakes. Make a cinnamon filling, like you would for a coffee cake. Pour half the batter in a cake pan. Then, swirl the cinnamon filling. Pour the remaining batter on top of the cake. Top it all off with a crumble topping and bake. You can’t use this recipe to make a cake roll either because its texture is so soft that it can’t easily roll. Use this recipe to make a sheet cake. When it cools down, poke holes with a bubble tea straw and pour thin caramel all over it. Top it off with frosting and serve. You must use pumpkin puree and NOT pumpkin pie filling because that will make the cake very dense. All ingredients must be at room temperature because that allows everything to blend together smoothly/ evenly. This cake can also be made in a 9 or 10 inch sheet pan. Allow the cakes to cool down completely before icing them because this will prevent the icing from melting all over the cake. I made a semi-naked cake to create a rustic look and did not frost the sides of the cake but you can frost the entire cake in frosting, if you like. Instead of yellow cake mix, white cake mix can be used as well. The brand of cake mix does not matter. In a large mixing bowl, add eggs, oil, water and mix until mixture is bubbly and smooth. Add pumpkin puree and mix until combined. Add cake mix, sugar, cinnamon, nutmeg, ginger and mix until smooth. Pour batter into 2 greased/floured round cake pans (Dimensions: 8x2). Spread evenly with a spatula. Then, use a sharp serrated knife to cut the sides and dome (if there is any). Place one cake on a cake stand and spread cream cheese frosting on top. Place another cake on top of this frosting and spread another layer of cream cheese frosting. Decorate with seasonal sprinkles and pumpkin candies. Enjoy!